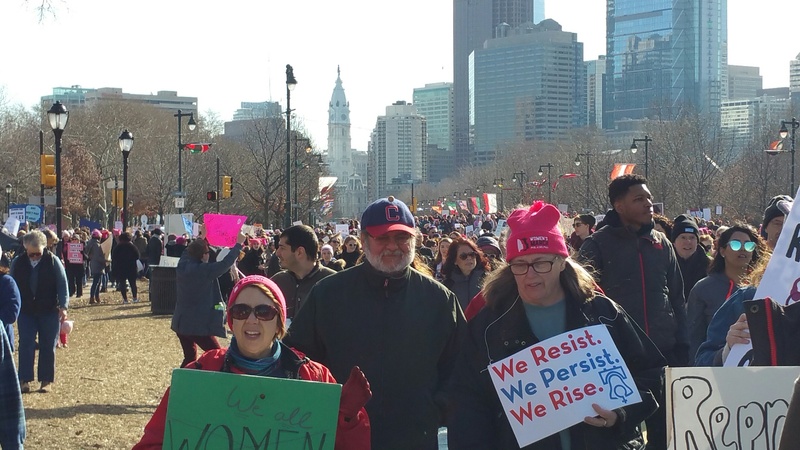 It’s been just a year since the Women’s March in January, 2017. During that year I decided to run for office, knocked on doors, crafted policy statements, and was elected to local office. That’s my story. 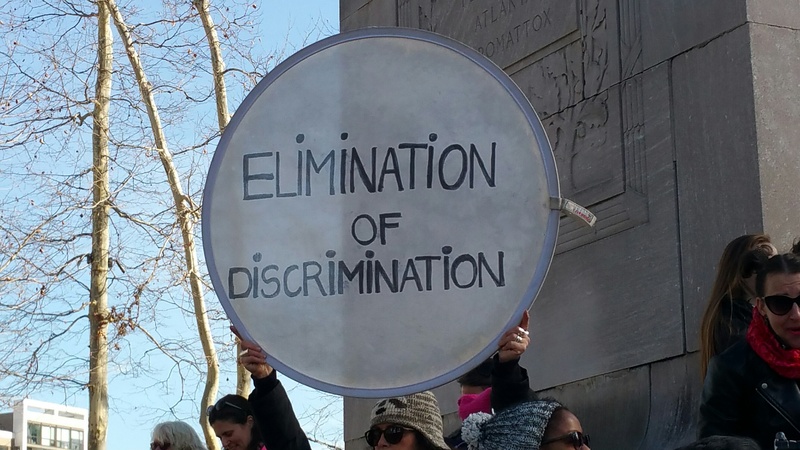 Behind other doors lay other stories: of sexual assault, harassment, mansplaining and diminishment, and every shape and form of bad behavior, policy, and pattern that necessitated the need for a woman’s march. We lived through the MeToo movement, and now Time’s Up. Through it all we relived our past and present pain, and wanted to believe that this year would be the one when it would end. 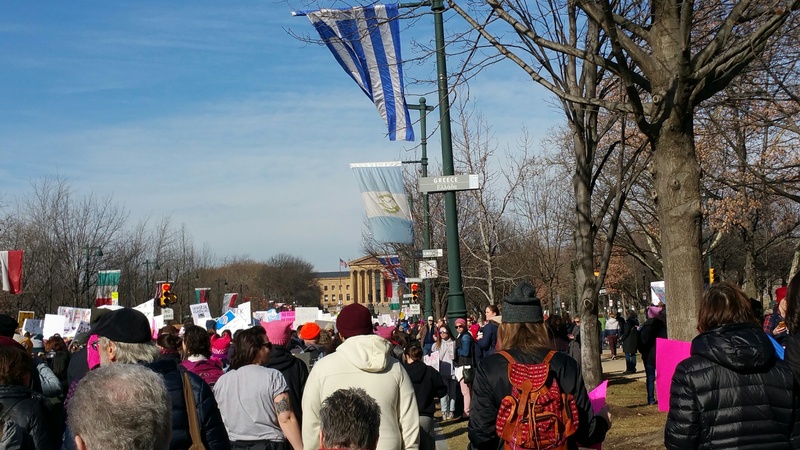 In 2018 I marched in Philadelphia, traveling by train from Chester County with my friend Ruth, my pussyhat, and my dreams. The journey began at Paoli train station. We parked and got in line for our tickets. 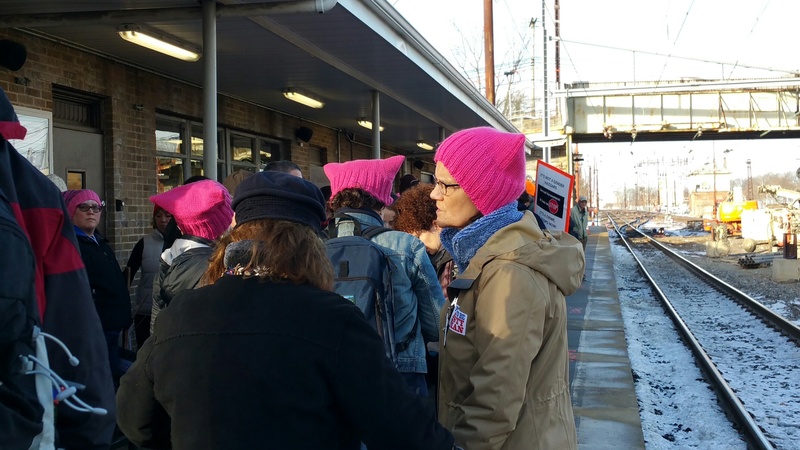 The station was filled mostly with women, many of them sporting their pink hats. Here is my group! 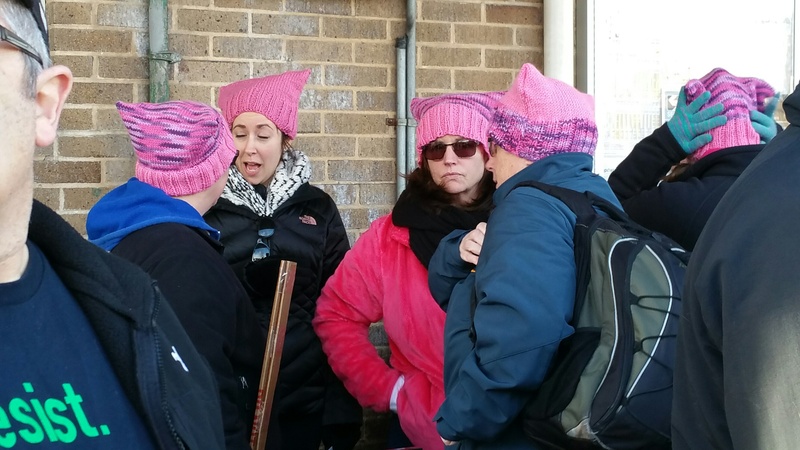 I met these women with coordinated hats. The mother of one lives in Chicago and knit the hats for this group of friends. When we arrived in Philadelphia we made a pit stop at the ladies room. 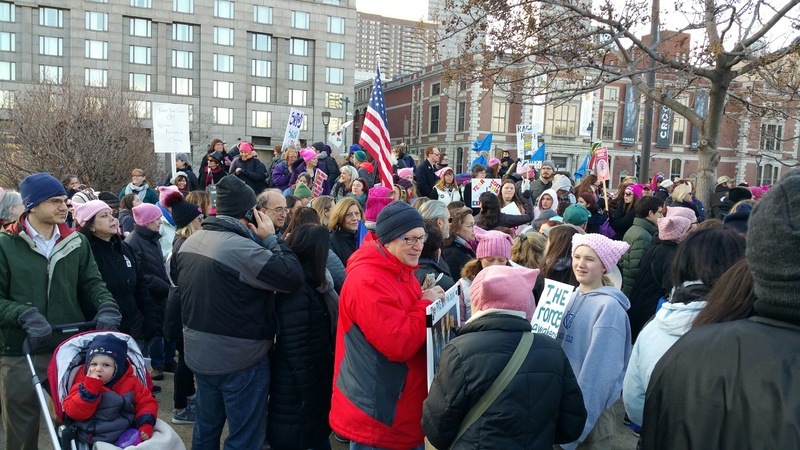 And then we headed out with hundreds and thousands of sisters, mothers, children, grandmas and their friends and loved ones. 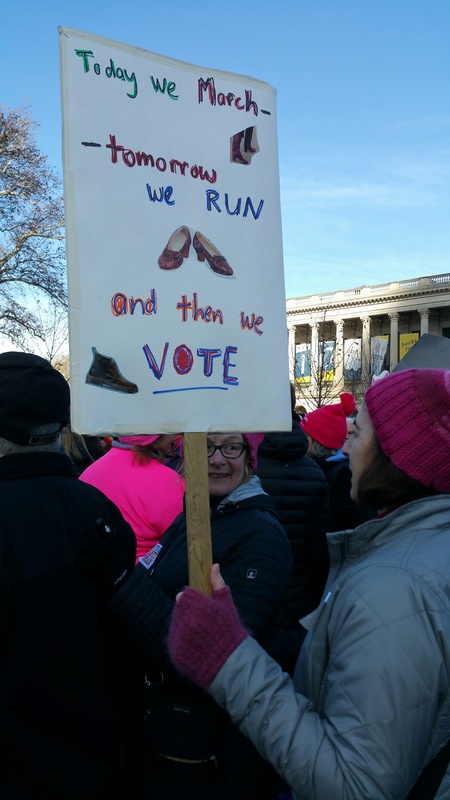 We marched. We sang. We listened to inspirational speeches. Many of the signs were political. All came from deep emotion and a heartfelt desire for a better and kinder world. 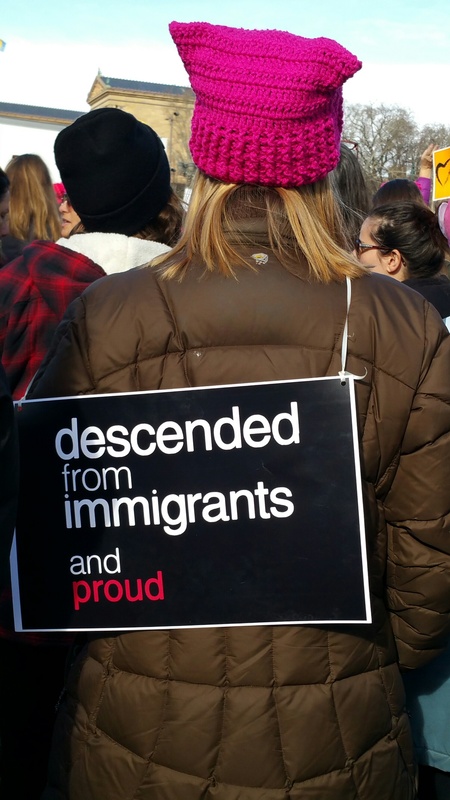 I loved this reminder that we are all descended from immigrants who came here to make a better life for themselves, often escaping hardship and violence like my own grandparents. 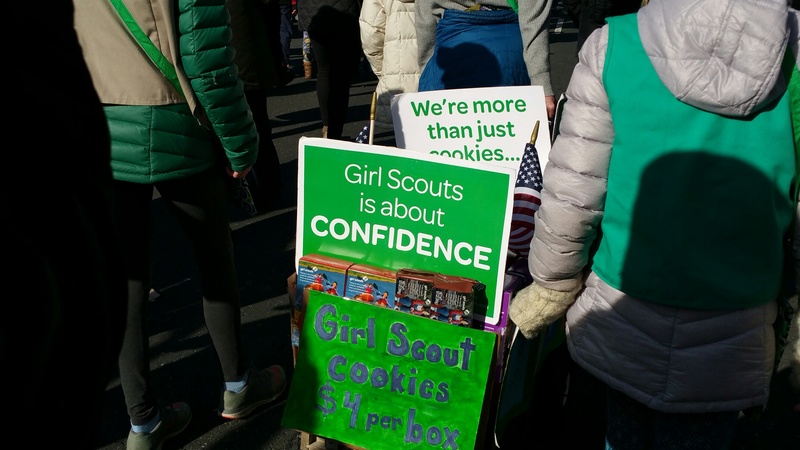 Even the girl scouts were there with their own signs . . . and cookies! One of the themes of 2018 was to get more women elected to office. Change comes when people are willing to get out of their comfort zone, to give up a Saturday afternoon to make a difference. Last year we were angry; this year we were hopeful. Here I am with my sign! 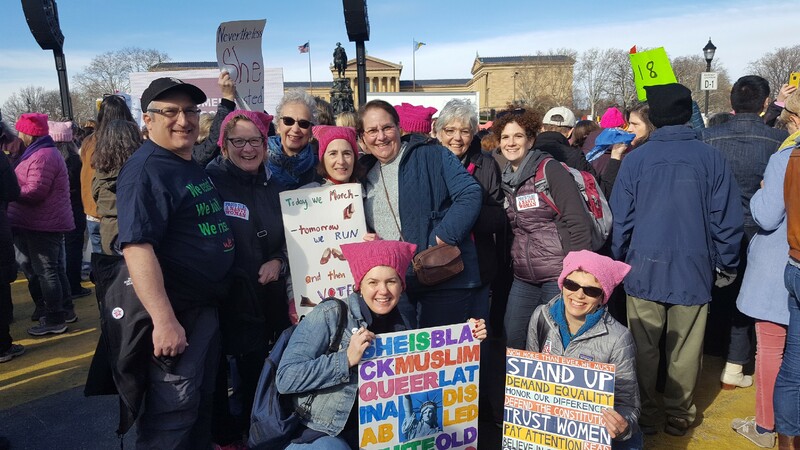 But beyond all the slogans, for me the Women’s March was a reminder that for all our differences in size and shape and experience and social status, we are partners in this great adventure called life, and if we don’t stick together, we will all fail. I’m going to give the last word to the great poet Maya Angelou.